Wheels in Carlsbad, California | Dealer Specialist Tires & Wheels Inc.
For some drivers, the biggest concern with their car is appearance. To maximize appearance, custom wheels and rims can be installed. Great looking rims are usually the first choice, but an owner's choice of rims really affects the car's performance too. Our team is made up of Industry Experts that are tuners and enthusiasts like you! At our shop you will always get true custom advice on vehicle wheels and car rims from an expert who is on the cutting edge of wheel style, wheel fitment and tire performance. 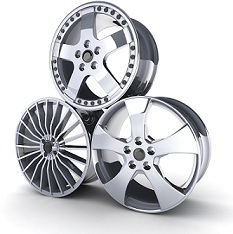 To ensure that we stay at the forefront of the wheel, rims and tire industry, our team is regularly given detailed instruction on all of the latest in applications for new custom wheels, rims and tires. If you are in the market for a new set of performance tires, custom wheels or rims, then there is only one answer, Dealer Specialist Tires & Wheels Inc.. For further inquiries, please contact us.